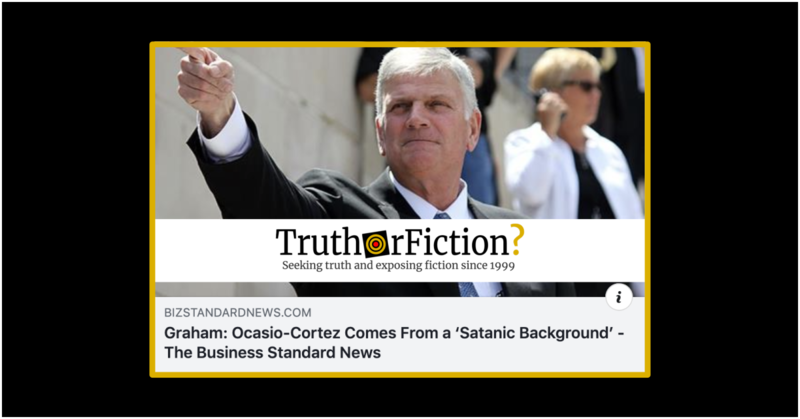 Did Franklin Graham Say Rep. Alexandria Ocasio-Cortez Has a 'Satanic Background'? - Truth or Fiction? An apparent news story contained a claim about a statement from the evangelist that was evidently very believable to many readers. Evangelist Franklin Graham said Rep. Alexandria Ocasio-Cortez comes from a "satanic background." We can’t go a day without some right-winger flipping out over Rep. Alexandria Ocasio-Cortez (AOC). The latest attack has come from evangelist Franklin Graham, who’s already known for his intolerant views. Graham has previously accused former President Barack Obama of carrying the “Muslim seed” from his father. However, Barack Obama Sr. was an atheist. Graham seems to be referring to Santeria, which is a blend of African pagan religions and Catholicism. It originated in Cuba and is practiced in many parts of the Caribbean. As is often the case for that particular website, BS News included a recent but unrelated Right Wing Watch item about a completely different person’s semi-related comments in order to create the impression of authenticity. Later versions of the original continued circulating on Facebook in April 2019. Did Alexandria Ocasio-Cortez Say ‘White Women’ Need to Have Fewer Children and ‘More Abortions’?